It's very important to identify the notes wether it is real or fake. 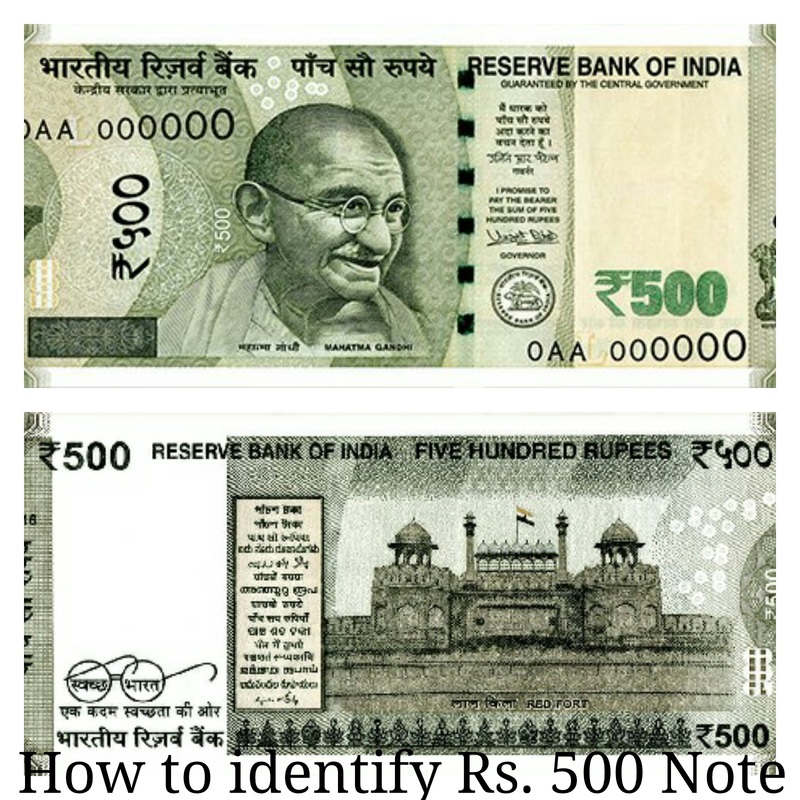 Here are few ways to check your note. Now a days in India most of the notes are found fake. So identify your original notes. Stay safe from frauds. 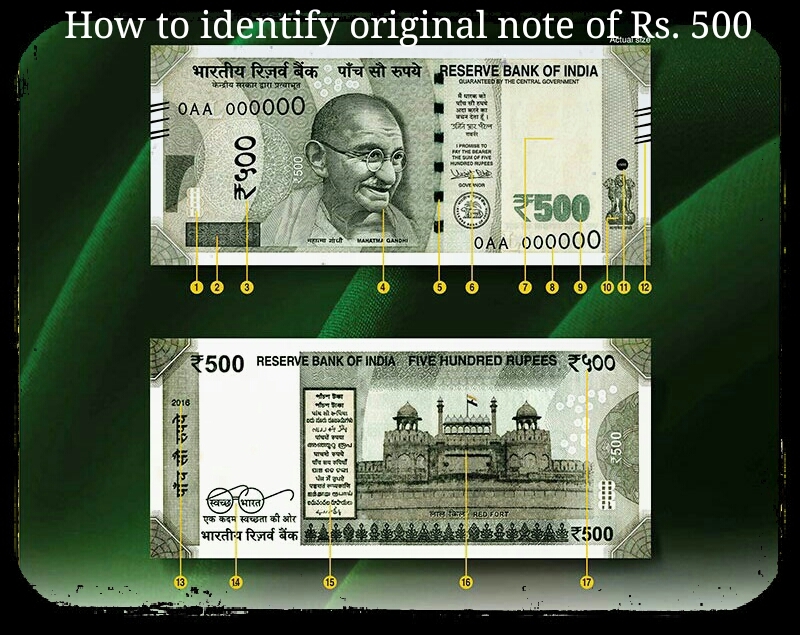 So today we are going to discuss about how to recognize original note of Rs. 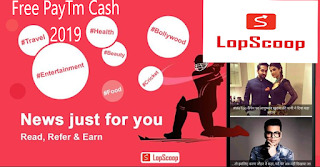 500 in easiest way step by step. To identify original notes is necessary to everyone. So don't cheated by frauds. Here we are going to talk about 17 different steps to identity your Rs. 500 note. The first step is see through register in denomination numeral you will find here written as 500. In second step check latent image of the denomination numeral here is written as 500. In step 3 check the Denomination numeral of Rs. 500 in Devnagari. In step 4 watch carefully the Orientation of Mahatma Gandhi's portrait changed this is very importan in order to identify original note. In step 5 watch carefully the color of windowed security thread changes from green to blue when note is tilted. In step 6 check the signature of the governor. Guarantee clause, Governor's signature, RBI emblem shifted towards right. In step 7 portrait and electrotype watermarks watch carefully you will find the picture of Mahatma Gandhi. In step 8 the serial number of the note growing from small to big on top left and bottom right sides. In step 9 check denomination in numerals with Rupee 500 symbol in colour changing ink from green to blue on bottom right. In step 10 watch the Ashoka pillar carefully which emblem on right for visually impaired. In step 11 the circle must be with Rs. 500 in raised print on the right. In step 12 see the 5 bleed lines on left and right in raised print. The bleed lines are total 5 lines two double line and one single line. The first line is double, middle line is single and last lines are also double. In step 13 check the year of printing of the note on the left. In step 14 see the glasses of Mahatma Gandhi there is written Swachh Bharat logo with slogan. In step 15 see the language panel towards the centre there is 15 different Indian languages. In step 16 see the Red fort an image of Indian heritage site with Indian flag. In step 17 denominational numeral of Rs. 500 in Devnagari on right. The size is 63mm x 150mm, color is stone grey with Red Fort and Mahatma Gandhi's image on each sides.